You’re in the city and need to knock out some work, make a few calls, or simply grab a breather. What are your options? You could go back to your hotel room, find the local Starbucks to fight for the outlets, or spend hundreds of dollars at the local co-working space. I don’t know about you, but this is a problem that I experience way more than I would like to admit. Breather is a new startup that intends to bring private space on demand, replacing the coffee shop workspace right from your phone. It is like Uber for workspaces. Launched in June this year at Le Web London by co-founder and CEO Julien Smith, his approach reminded me of something I would have read in a Rockefeller story, paced and deliberate. “Breather is a network of beautiful spaces inside a city. You can use the space whenever you want and where ever you want and you can unlock them with your phone,” says Smith. 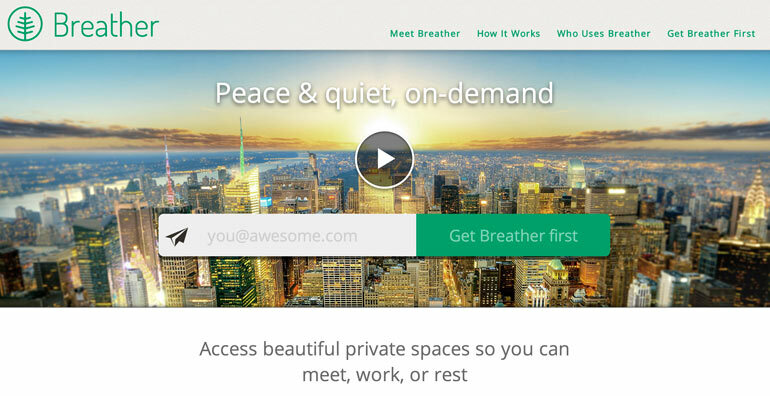 “Fundamentally, Breather provides peace and quiet on demand”. Breather prepares peaceful workspace that will give its users the same experience every time. Like your favorite meal at your favorite restaurant, you will know what to expect each time you return, regardless of where you are. By placing sensors in each room, Breather know what things are being used, what things are not, and how exactly to better optimize their spaces. Don’t be scared though, there’s only a camera on the lock outside the room. Safety is also being carefully considered. Not just anyone can use a Breather space. You have to be invited by someone who is gong to vouch for you and because your credit card is put into the app prior to booking, it is unlikely that someone will abuse the space with illegal activities. They have already received requests from cities around the globe asking to place workspaces in their cities. These types of requests prove that the concept is in demand and Breather is serious about controlling the speed of growth and locations. Growing in the right order is essential to their success. The Breather team is the strongest piece of the startup. Smith told me that his mobile team is one of the best in the world. The team handled Angry Bird level traffic before coming to take this challenge on. The excitement in his voice when talking about this team was almost contagious. Soon, Breather will be looking for community managers to ensure that specific cities are being managed properly. Smith told me that this is the weakest part of the startup at the moment, and they knew from the beginning how important this role was going to be. “It seems kind of crazy, that an app on a phone could unlock hundreds of spaces in a city whenever you want it to for a reasonable fee. When it happens, you will never be able to look at a city in another way again. You will go to a city that does not have private space on demand and you will be like “this city is backwards” just the same way that ordering a taxi the regular way now seems backwards,” Smith said. Breather will launch in New York City in October and will grow to other larger cities like San Francisco. After that, they could appear anywhere across the world. Tony Monteleone (@StartupTony) is a serial entrepreneur and does Business Development for PERQ, a measured marketing software and services company that specializes in increasing online and in store traffic for businesses. He also serves as the Indianapolis Chapter Director for Startup Grind. It doesn’t matter how world changing your idea is; if you need money to make it happen, but ruin your opportunities in front of potential venture capitalists, it’s not going to make it off the ground. Venture capitalists are a unique bunch and pitching to them requires a unique strategy. There are four main categories that you need to perfect in order to really nail it, and a few things to note in each one. Before you ever step foot in the room to give your pitch, you’ve got plenty of homework to do. Knowing your audience is a key component of nailing a pitch. If you’re pitching to a VC firm, know who they are and what they’ve invested in previously. If you’re working with an angel investor, know who that person is and what he or she does. Remember, not all money is good money. You’re interviewing the VC as much as they’re interviewing you. Come prepared with questions. A seasoned investor will be able to bring more to provide you with industry knowledge, introductions, and connections. Don’t just take money to take money. When you’re putting together your presentation, it shouldn’t be any more than eight slides. Avoid using tools like Prezi—investors are going to jump into your pitch with questions whenever they want, and you may have to skip quickly to another slide to make a point that you planned to make later. Make it easy on yourself by using a presentation tool like keynote or PowerPoint, which has more flexibility. Your opening statement should convey your idea in two sentences or less, just like an elevator pitch. This is your first and biggest opportunity to say everything you need to without confusing anyone. Being clear, precise, and simple can’t be overstated. There’s no reason to overcomplicate the issue in your opener, or for that matter, anywhere else in your presentation. After your opening statement, tell a story that helps your audience understand the problem you’re trying to solve. Get creative, and make them feel the pain of the problem. The rest of your pitch will show how you plan to solve it. If you don’t have a clue where to start for your statement, there are tools out there to help. Harvard Business School created an elevator pitch builder that walks you through a simple and easy method for building a pitch. Founder Institute developed a MadLibs method for developing your pitch. These are two of the best resources available for getting a solid start. Frequently, a VC may not be investing in your idea as much as in your team. Highlight the team in your presentation by showing the kind of things they bring to the table, and show what makes them unique. Frequently, a good team can take a mediocre idea and do incredible things with it. At the same time, a weak team can completely ruin a great idea. Show them why your team wins. There are five primary points that need to be covered in your pitch presentation. The idea. This is your opportunity to elaborate more on the opening statement and discuss the idea behind what you’re trying to do. Your solutions. Why is your solution best, and why is it going to work now? Traction and validation. If you have a product already built, talk about customers or conversations with experts. Anything that will validate the need or want for the product is key in showcasing your idea. You have to have proof that you’ve done your research and development. If you’ve made a single dollar doing this, make note of it. This is also your opportunity to be honest with them. If you have a weakness (and you do), bring it up. Whether it’s the team, industry, or lack of money, point it out before an investor does. The future. How will your idea change the industry? Focus on the positive changes here. What you need. You’re in front of VCs for a reason. They don’t know what’s in your mind. Come right out and ask for exactly what you need. That isn’t just how much you need, though. Talk about what the deal structure looks like. It’s always good to talk with a startup attorney before pitching. They’ll help put together a deal structure among other things. Cover these topics, and you’ll nail the VC pitch. Make your points quickly, and don’t get frazzled. Remove any buzzwords from your presentation entirely, and don’t take yourself too seriously. And limit name-dropping. Just because you hung out with Mark Cuban at the Super Bowl doesn’t mean they’ll invest in your idea. Have fun, be passionate, and bring it home. Tony Monteleone(@StartupTony) is a serial entrepreneur and does Business Development for PERQ, a measured marketing software and services company that specializes in increasing online and in store traffic for businesses. 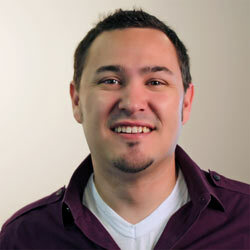 He also serves as the Indianapolis Chapter Director for Startup Grind.